Pranayama is the general definition given to all the breathing exercises performed in yoga. The main focus of pranayama is the effect over the mind and senses of calm and quietness. Pranayama is a subtle yoga technique which aims to expand prana. Many translations are given to prana, like energy, strength, vital energy, among others, but none of them is entirely accurate. Prana is prana, the first source of energy present in the air, food, water, light, all of these vehicles of vitality that feed you. The primary goal of pranayama is, by interfering with the breathing patterns, to influence directly on the mind’s state and to calm down the senses. The physical effects, even if secondary, are also reported, namely, better digestion, the stimulation of the liver, kidneys and other vital organs, vitality and a reduction of lactic acid speeding the recovery from fatigue. 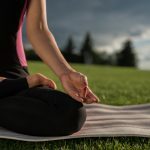 For all of these reasons, pranayama is essential at a yoga practice, not only because it helps recovering from the physical effort, but mainly because it improves the focus needed for meditation by acting on the mind. Generalising, most pranayamas intent a capacity to breathe slower than the usual, what can be called of hypoventilation. Deep and complete breaths result in longer respiratory cycles, and you end up breathing less air. For this reason, it’s easier for the bloodstream to nourish the brain and the heart, as well as the oxygen is more efficiently transferred to the cells of the body. Besides, it calms the central nervous system and reduces appetite. First of all, pranayama must be started under the supervision of a yoga teacher. Differently from many other practices, the progress must be slow and always on the comfort zone. The first step is to acquire complete breathing: nasal, deep, conscious, full, controlled, slow and uniform. Although many times the abdominal breathing is used in yoga, for pranayama, the practitioner must be able to distinguish and breath to both abdomen and thorax. Initially, the practitioner starts with lower rhythms, that grow over time. It means to keep a track on the inhalation and exhalation timings and also work on the traditional pranayama direction of breathing: double ascendant. Inhalation starts by filling the abdomen with air, followed by the intercostal zone and then chest. In the exhalation the belly goes towards the back in first place, then intercostal and chest zones descend. Expect a slow progression and don’t stress about it. After some time and being comfortable with the complete breathing, retentions with and without air are softly introduced. There is a considerable diversity of pranayamas, being one of the most common (because it’s also used during asanas) and the one that enables to be in comfort with complete breathing, the ujjayi pranayama, which consists of breathing in and out contracting the glottis making a whisper sound. Pranayama has the capability of interfering with our energy and mind, and for that must be done with consciousness. Advance slowly, without jumping steps, comfortably and without tension. Breathing is definitely one of the biggest tools we have to influence our energy, our life and our well-being. For that, it’s worth to put on some energy and time to go deep into this practice.